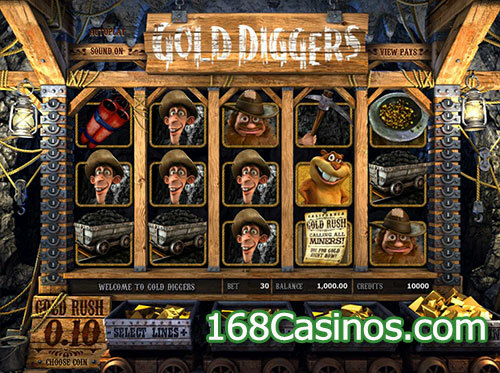 Gold Diggers Slot is precisely a five reels 3D slot that offers thirty paylines betting options and not to forget its visual appeal is the USP of the slot which makes it a stand-apart slot. Before talking about anything else we must look at its home screen and try to find out anything unimpressive. Sorry, but if you want to find any mistake made by the developer, you will have to be disappointed since whole home screen is perfect presentation of how a slot design should work. We have a big reel matrix that looks like to be designed on wooden like structure and at bottom we have the four draws which actually are the navigational buttons but their presentation is so done that they look Amirah’s shelfs having Gold inside them. Generally, it is assumed if any slot is having loads of features its wagering requirement would be higher and low rollers stay away of it but this slot is an exception to this general rule. Despite having tons of alluring features, this slot can still be classified into penny slot for the way money wagering is designed by the developer. 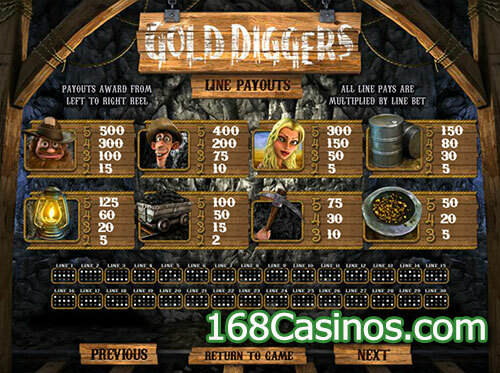 The minimum bet per line in Gold Diggers is $0.02 while $0.50 is the maximum which brings it into comfortable range of every slot player. If you are a high roller, then you are allowed to double down your bet per line up to 5X. The maximum bet comes to $75. No slot variant can survive for long if it does not have an easy to go through gameplay that could as well look straightforward to aspiring slot players and this slot game is a perfect example of how creative a slot designer can be. Betsoft has made it sure no player finds himself stuck with nonsense options hence they have added all the pick able options at one location so any player could pick them easily. Moreover, to avoid any confusion there is also a live support feature which can be used if needed by the players. So, if you are convinced with its features and want to play it, start picking the base options, like paylines, coins, and their value. Once done, hit the Spin and reels will start rolling to offer your final landing screen in few seconds. 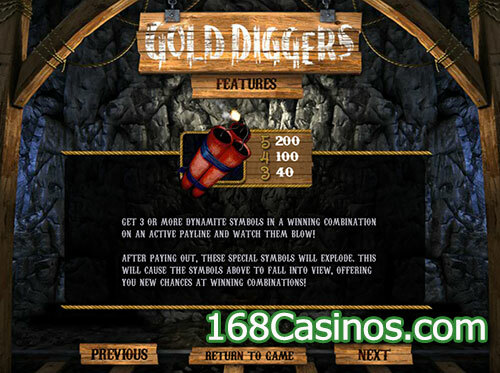 To make its gameplay even more enticing and aspiring by slot players, developer has added several bonus rounds and Dynamite Bonus is first of them which is activated if you have three or more of the dynamite bonus symbols in a winning combo on an active payline; they’ll pay out and then explode, allowing more symbols to fall into place from above with the possibility of forming new combos. 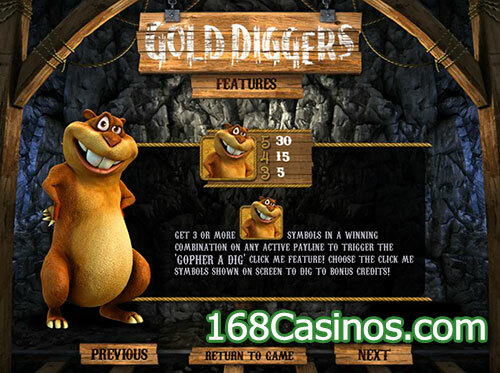 Apart from that there is also a Gopher A Dig Bonus which is activated when you have three or more of the cheery gopher bonus symbols on an active payline. In this round, you need to click on the symbols which now appear in return for cash prizes. 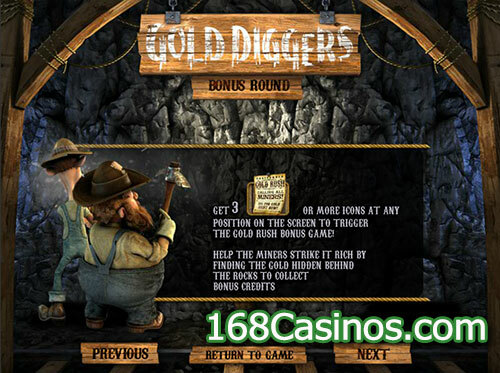 Likewise, there is a Gold Rush Bonus which activates three of the poster scatter symbols anywhere in view which initiates another picking game and you help miners to locate pockets of valuable gold behind various places on the rock face.